We’d love your help. Let us know what’s wrong with this preview of Engaging with God by David G. Peterson. To ask other readers questions about Engaging with God, please sign up. I don't come from the same tradition as the author but he challenged me to think through what we do as a church and how we define worship. I thought his background of the Old Testament was helpful. 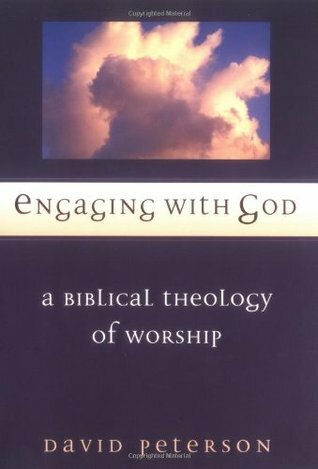 Peterson's Engaging with God is an excellent resource for thinking through worship. Some chapters are more difficult than others, but the one who takes the time to read through this book will be rewarded, helped, and better equipped to discuss worship. After reading this book, I would also recommend the first chapter of Carson's book Worship By the Book. Carson speaks favorably of Peterson's work, but has a few critiques of the book. I think readers will actually enjoy this book better if they r Peterson's Engaging with God is an excellent resource for thinking through worship. Some chapters are more difficult than others, but the one who takes the time to read through this book will be rewarded, helped, and better equipped to discuss worship. After reading this book, I would also recommend the first chapter of Carson's book Worship By the Book. Carson speaks favorably of Peterson's work, but has a few critiques of the book. I think readers will actually enjoy this book better if they read Carson's chapter. Thorough examination of worship throughout Scripture, with helpful application for modern-day Christians. Perhaps a bit too dense for casual readers, but a worthwhile resource. David Peterson served as principal at Oak Hill College in London and also as lecturer in New Testament at Moore College in Australia. In his work, Engaging with God, Peterson tests the hypothesis that “the worship of the living and true God is essentially an engagement with him on the terms that he proposes and in the way that he alone makes possible” (Peterson, 20). In order to confirm his hypothesis, Peterson examines beliefs and practices of Old Testament (OT) religion, then presents key word David Peterson served as principal at Oak Hill College in London and also as lecturer in New Testament at Moore College in Australia. In his work, Engaging with God, Peterson tests the hypothesis that “the worship of the living and true God is essentially an engagement with him on the terms that he proposes and in the way that he alone makes possible” (Peterson, 20). In order to confirm his hypothesis, Peterson examines beliefs and practices of Old Testament (OT) religion, then presents key words for worship in the OT, and lastly observes how the various New Testament writers use the language of worship. Peterson’s method is that of biblical theology in which he considers the historical context of each section of Scripture. His purpose in writing is “to help Christians today retrieve the richness of biblical worship, so that the church can be built up and become more faithful to its intended pattern (Marshall, 9). Put your theology glasses on for this one! Peterson's exploration of Christian worship is dense and comprehensive. He spends a lot of time looking at forms and types throughout scripture as an avenue to describe and inform true biblical worship. I found it dry and hard to read, but I'm not a systematic theology type of guy. This book on understanding what the Bible has to say about worship is thoroughly refreshing and devotional. His insights into familiar passages were enlightening. I worshipped a lot as I read this book. Warning: it’s a technical book. You’ll get caught up in the beauty of Scripture at times but also bored with few captivating stories or illustrations. This was an excellent book, surveying much of the relevant biblical material on worship, and rightly emphasizing the foundational priority of the gospel of Jesus Christ to define our worship. Recommended. An excellent book that has become one of the standard theological books on worship from an Evangelical perspective. Though Christian worshipers from other traditions would enjoy it also and find useful pieces to add to their theology of worship. In short. Engaging with God is what I believe to be the closest thing to a compendious treatment of worship in the bible. Overall there is no other book that I have read that has given more a complete picture of biblical worship with the landscape of redemptive history than Engaging with God. If you have read The Mission of God by Christopher Wright and thought Mission is everything, I would suggest this book to one who is open to the notion that Worship is even more. That is not to say one has In short. Engaging with God is what I believe to be the closest thing to a compendious treatment of worship in the bible. Overall there is no other book that I have read that has given more a complete picture of biblical worship with the landscape of redemptive history than Engaging with God. If you have read The Mission of God by Christopher Wright and thought Mission is everything, I would suggest this book to one who is open to the notion that Worship is even more. That is not to say one has priority over the other per say. Rather, it is to say that the purpose of redemption finds the redeemed responding, as an effect, in acceptable worship. God saves, we worship. As John Piper said "Missions exist because Worship does not." This is the fundamental truth within Engaging with God. It's premise is that God has engaged with man in order for man to engage with Him. For many this work might come off a little too academic for their taste and I guess it's true in one sense that it is not for the armchair worship leader, as it does not give many practical prescriptions to how you can become a better worship leader (practically) for your local church. However I believe it would serve those in the Worship ministry well as it would give greater substance to perhaps one's loose foundation on the question of Why we worship. I will finish this review with a segment of the introductory quote in the book. This book was actually pretty good. It is more of a scholarly type book, with nuances of the Hebrew and Greek words that determine a more accurate reading of Scripture. But I did enjoy it very much after getting used to his style of writing. If you are interested in finding out more about how worship, in the Christian church, came about, this is a good introduction to that subject. If you want to learn more about how the writings of Scripture influence the aspects of worship that we use, this is This book was actually pretty good. It is more of a scholarly type book, with nuances of the Hebrew and Greek words that determine a more accurate reading of Scripture. But I did enjoy it very much after getting used to his style of writing. If you are interested in finding out more about how worship, in the Christian church, came about, this is a good introduction to that subject. If you want to learn more about how the writings of Scripture influence the aspects of worship that we use, this is a read for you. And finally, if you want a book to remind you of the importance of being a church seeking the glory of Jesus, this is a must read for you. Slowly working through my summer reading list. Two books left to go. This was a fantastic look at the theology of worship, encompassing all of scripture. At times I got bogged down, but for the most part I was very engaged. Has it changed my view of worship? Only in the sense that I am much more aware of instances and imperatives of worship when reading and doing scripture work. My favorite chapter was the first chapter, "Engaging with God in the Old Testament". This book is not your typical "Here are the references to music in the Bible, so you should or should not use ..." Rather, it is a thorough and true biblical theology of worship through the Old and New Testament. Those looking for a practical resource may be disappointed, but this kind of book is where every biblical musician should begin. This is a very good book in that it represents the hard work that must be done to gain a comprehensive understanding of biblical worship. I wouldn't necessarily recommend it to the lay Christian seeking an approachable resource on the subject, but pastors and theological students will find it very helpful. This is, by far, the best book detailing a biblical theology of worship. There is much scriptural depth and substance on every page. Don't expect this book to solve any of the worship wars or spell out more detailed issues. Rather, this book and its content is a 'starting point' for your church when it comes to worship. Bob Kauflin: "A thorough and reverent exposition of biblical worship. Peterson is a New Testament scholar, and his treatment of worship is eminently Christ-exalting and gospel-centered. He highlights the connection between worship and edification." An extremely thorough treatment of the practice of worship throughout Scripture. Invaluable for answering the question, "What did worship look like in (fill in section of Scripture)?" But, it was not particularly easy to read. Top of the list for digging into the theology of worship. Has a lot of historical context, especially when dealing with the Old Testament and the worship practices of ancient Israel. Certainly was academic in it's style and approach with I appreciated, but it did make it work to read though. This is a STANDARD on the subject of worship! Most good books on worship will have at least one quote from this book. MUST HAVE! The only reason I didn't give it a 5 is that it's a bit dry. But this is definitive book on the subject. I thoroughly enjoyed this read, though it was slow-going in a few places. I was going to rate it 4 stars, but then changed it to a hearty 5 as I reflected on the impact this book made on me. Every "worship leader" should have to read this.